Pioneer's LTE rearview mirror can display information such as maps and weather. If your car isn't smart and connected yet, Pioneer has a rearview mirror that can do the trick. The audio equipment maker showed off what it calls a "rearview mirror telematics unit" with LTE connectivity that displays cloud-based data such as navigation, traffic conditions and weather updates. The real-time info is displayed on a 5-inch LCD that functions as a mirror when it's not showing anything. It takes up part of the unit's surface beside the dedicated mirror and can also display video from a linked rearview camera. Info can be accessed via voice commands or the touchscreen interface on the LCD. The LTE connection also enables it to be a Wi-Fi access point for mobile devices in the car. The back of the unit has a forward-facing, wide-angle camera that can serve as a drive recorder. It can warn drivers when they drive erratically or when a vehicle ahead changes lanes. 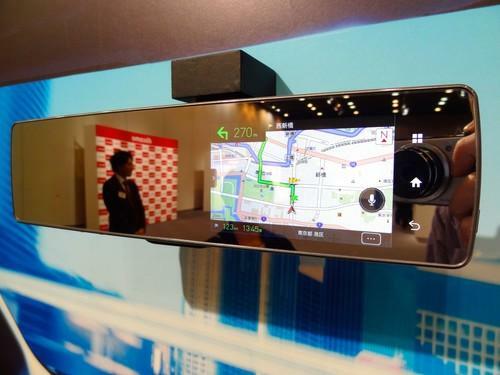 "The unit's image recognition and recording functions, as well as the wide field of view, are benefits of using a rearview mirror format for this kind of connected device," a Pioneer spokesman said. "It's also well positioned to recognize voice commands from the driver." The company has not announced a price or availability for the mirror, but said that in Japan it will be eligible for ¥300 (US$2.75) monthly connection fees from mobile carrier NTT DoCoMo, which helped develop the voice command system. Pioneer plans to commercialize the mirror by next April, and could market it as a fleet-management device for trucking companies and other firms. Pioneer has been refocusing on in-vehicle devices instead of home electronics. Earlier this month, the former TV manufacturer announced a deal in which Onkyo will acquire all shares in its subsidiary Pioneer Home Electronics, which produces home audio systems, headphones and Blu-ray Disc players.